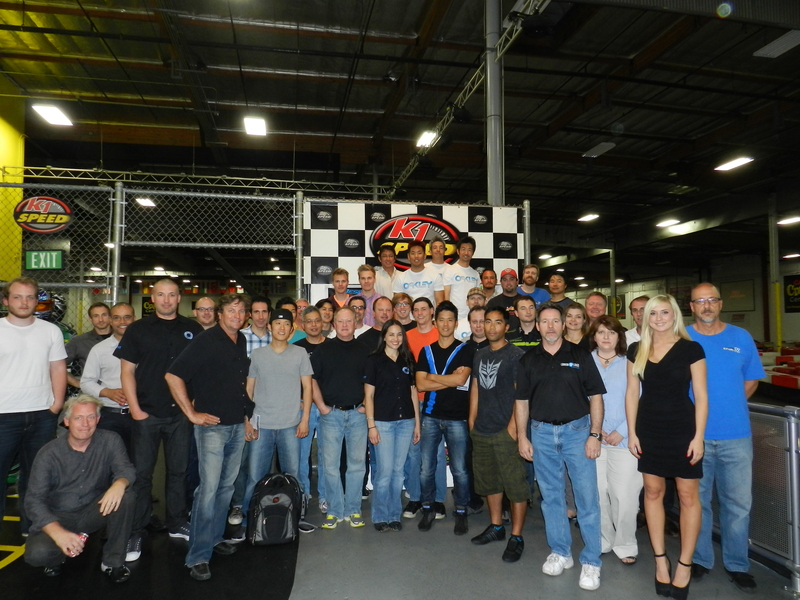 After an almost 3 year absence, Designer Night at the Races™ returned to California last Tuesday night at K1 Speed. 10 different design studios from around the SoCal area arrived in Irvine to test their skills against each other. When the smoke cleared (figuratively speaking of course – smoking is not an image you want with electric karts) 19 racers took home trophies (unfortunately one in error – but more on that later). So after a quick thanks to the people who made it happen, we will get on with the results. Events like this cannot happen without a lot of hard work on the part of a lot of different people so I’d first like to thank my modest staff at AACS (Steve, Aaron, Brian and Lindsay) and for all they did to make the event happen. 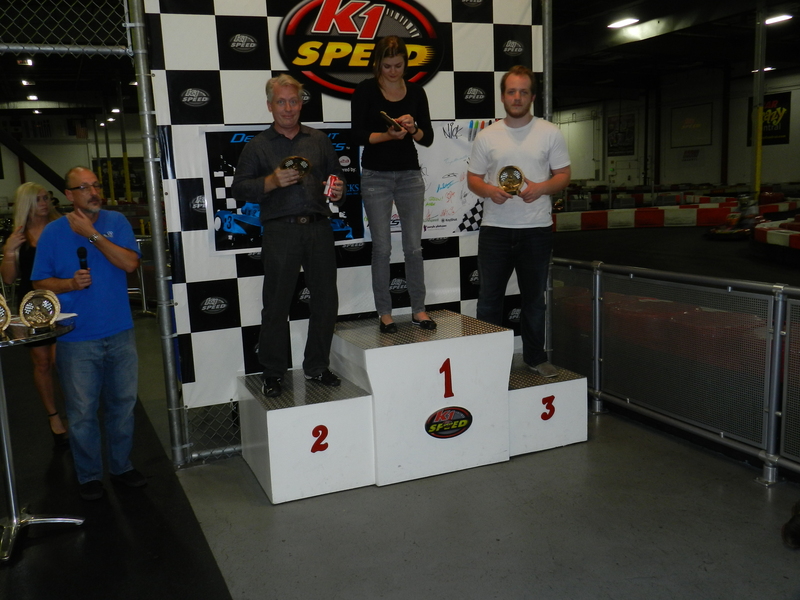 After the staff you certainly cannot forget the host and K1 Speed did a great job for our first visit. While we had some small hiccups, we can expect an even greater time (and more track time) at the next event. But all of that work doesn’t matter unless you have sponsors and we had a great set of sponsors for this event. Lacks Enterprises was our title sponsor and has supported every event since the first one in 2006. Lacks provides world-class Automotive Exterior Grilles & Trim, Interior Trim and Wheels in a variety of basic and advanced finishes. Purple Platypus, the exclusive reseller of Objet’s high resolution 3D printers in the Southwest, awarded a 3D Printed trophy to the fastest designer on each night. Luxion specializes in advancing state of the art technology for computer based lighting simulations with products such as their KeyShot software. Bunkspeed provides 3D software, modeling and animation software for advertising, automotive design, photography, architecture and industrial design. And finally, F1Paintlab, which produces radio controlled Formula 1 race cars provided the team “trophy” for the evening that is pictured above. After the 50-some racers finished qualifying, it was time for the first of the heat races. 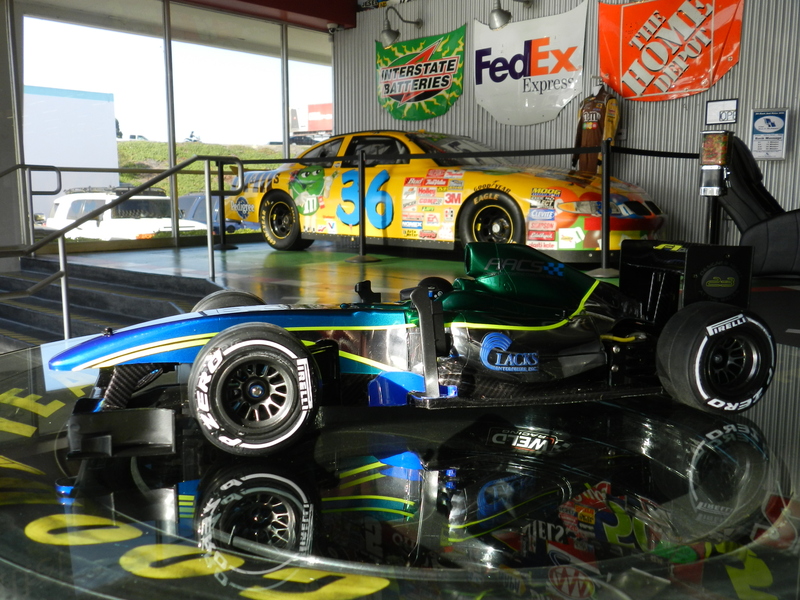 The F-Main saw Fisker and Nissan square off against a sole driver from Nissan. Jacqueline Reeve from Nissan ran almost a full second faster than her closest competition for a flag to flag win. Reeve was followed by the father and son team from Fisker, with dad Alexander beating son Phillip across the line and proving that old age and treachery will beat youth and good looks every time. The F-Main was also home to our most improved driver of the evening as Stephanie Rodgers of Fisker knocked almost 2 1/2 seconds off her qualifying time in the race. In the E-Main we saw 8 drivers from 8 different teams compete for the win. A blanket could have been thrown over the field as only 0.323 seconds separated the pole sitter from the back of the pack. 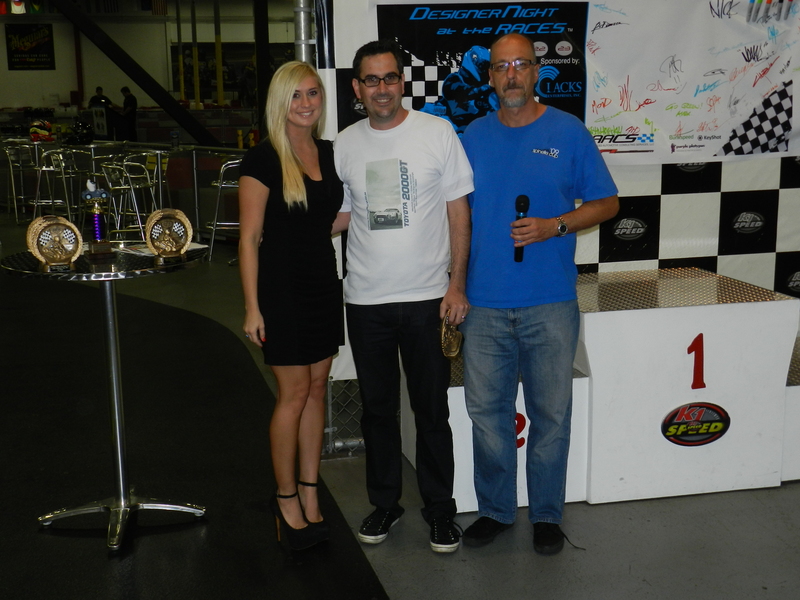 In the end Nick Garfias from Oakley edged out Jesse Sowden from Kia and Chris Drozdowski from Hyundai for the win. The D-Main had a similar tight qualifying session as 0.357 seconds covered the fastest and slowest qualifier. As with the previous race, different teams were represented on the podium as Andrew Moir from Hyundai managed a 4.7 second win from the pole over Eugene Jung from Ford, who finished a scant second ahead of Brian Fioritto from AACS. The C-Main was the first race of the evening where the pole sitter did not win as Timonthy Farnum of Toyota passed Matt Mantz from Honda to take first place while Ivan Lampkin from Fisker finished third. The B-Main was the tightest field of the evening as only 0.093 seconds separated first from last. 3 drivers from Mercedes were in the field but in the end only Felix Koerner trophied with a 2nd place. He was bracketed by Ryan Campbell from Nissan who finished third and Frank Schwartz from AACS won started third and won (yes, you host managed a trophy at his own event over rumblings about a fix from the other competitors). Which brings us to the most exciting race of the evening, the A-Main with the fastest 8 drivers competing for the title of Fastest Designer, Fastest Lap and Fastest Studio. The entire field swapped positions lap after lap en route to the closest finish of the evening. In the end Toyota took the lead in the Studio race with 1st, 2nd and 5th place finishes for a one night total of 48 points. 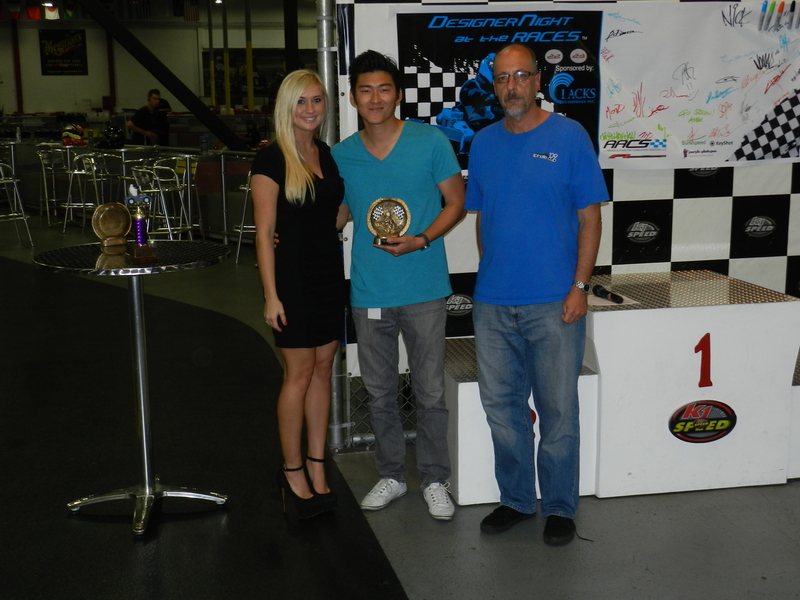 Michael Kim from Toyota managed a tight 1.3 second win over teammate Iliya Bridan for the win, followed in third by Fastest lap winner Joel Baek from Nissan. 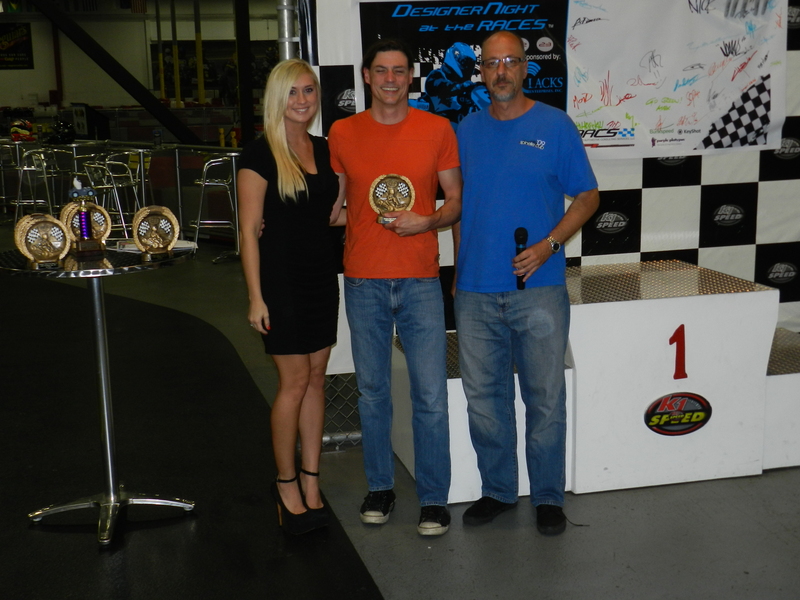 Which brings us to an apology – due to a scoring error from event host K1 Speed – the fastest lap award was incorrectly given to the wrong person at the event. Rest assured, we are in the process of having a new trophy produced and will be getting that to Joel as soon as possible. For a complete list of the event results and a bunch of pictures, please visit our website at http://www.supplierconsultants.com/designer_night_2012_05#results. I want to thank everyone again for coming out and see you at the next event in October! This entry was posted in Designer Night at the Races and tagged Bunkspeed, Designer Night at the Races, Lacks Enterprises, Luxion, Purple Platypus. Bookmark the permalink.